It would have amused Vaclav Havel to be featured in a journal that celebrates adventure, almost as much as it would have amused him to be celebrated as a great hero of ’68. Though he was capable of physical bravery – on more than one occasion he skied to precarious mountain locations to evade lazy secret police – his natural habitat was the late-night coffee-house, discussing ideas in a fug of cigarette smoke. Yet Avaunt has chosen Havel to celebrate the spirit of ’68 because this extraordinary self-deprecating man did perhaps more than any other individual to translate its anarchic avant-garde spirit into a political vision that became reality. He was the dissident who became president of Czechoslovakia; a devotee of rock’n’roll and philosophy who used his artistic insights to launch devastating attacks on the communist establishment; a bohemian bon viveur whose moral courage helped change a political landscape. If you had met him in Prague in the late Fifties, you would have found yourself looking at a young man sporting a quiff, winklepickers (known in Czechoslovakia as ‘Hungarians’), striped socks and a low-cut jacket. As a teenager he got high on Aquinas, Kant and Hegel, earning his spurs as a rebel intellectual in the grand art deco Café Slavia, which he would later describe as ‘my literary kindergarten’. The cool was far from effortless – from his childhood he was both diffident and physically awkward, and even when I met him in 2009, long after he had become internationally renowned, he protested that ‘I’m a shy person’. But a thirst for thought meant he had no fear in seeking out and befriending leading thinkers of the Czech nightlife scene, while his aspirations to write meant that he had a heightened awareness of writers who were being persecuted. In 1956 he began to mark himself out as a political figure when he spoke out publicly about their unfair treatment at the hands of the Communist regime. An unplanned stop at Ruzyni Prison, where Vaclav Havel had been imprisoned. Prague, 17 March 1990. Photography: Tomki Němec. His own difficulties had begun at the age of fourteen, when he was branded a ‘bourgeois element’, and was forced to leave school, so he could ‘redeem’ himself through manual labour and taking on the values of the working class. Did this accident of fate end up pushing him to greater heights than he would ever have attained? Even if you were to debate this for several hours, perhaps smoking cigarettes and drinking Becherovka, the straightforward answer is that there is no straightforward answer. Havel’s difficulties may have led to his being president, but he came from a wealthy family whose members had demonstrated themselves to be natural pioneers for decades. His grandfather was a construction and property magnate whose developments included Lucerna Palace – the city’s first multipurpose shopping and entertainment complex – celebrities who performed there later in the century would include Ella Fitzgerald and Louis Armstrong. His father and uncle also went into property, but they – like Havel himself – found their vision changed after visiting America. In love with California, his father radically reinvented Prague’s architectural style, interrupting the chocolate-box pretty Baroque and Rococo landscape with the first flat-roof functionalist villa as part of an exclusive property development. His uncle’s passion for the West Coast led him to build the Hollywood-inspired Barrandov film studios, which would become one of the largest filmmaking facilities on the continent. Havel at the first public concert of the singer Marta Kubisova after her 20-year performance ban. Prague, 1 June 1990. Photography: Tomki Němec. Havel himself – nicknamed the Dung Beetle at school – was famously embarrassed by his privilege, and once, when asked to tell the class what his father did, muttered that he ran a couple of bars. But when the Communist putsch of 1948 turned this privilege into a crime, his life was turned upside down, and he was made to earn his living as a chemical laboratory assistant at the Prague School of Chemical Technology. He continued his education at evening classes. An early desire to become a scientist was supplanted by the ambition to express his political and personal thoughts as a poet. He also wanted to work in film, but his attempts to get into film school were repeatedly thwarted by the communists, so after a stint in the army, he decided his rebellion would best be expressed through playwriting. In front of the Federal Assembly, Czechoslovaks demand that deputies elect Vaclav Havel President. Prague, 19 December 1989. Photography: Tomki Němec. In 1963, he wrote The Garden Party, an excoriating comedy in which a young middle-class man, Hugo Pludek, is encouraged to advance himself by going to meet the powerful Mr Kalabis at a garden party held by the Liquidation Office. In a Kafkaesque twist, he never finds Kalabis, but after a surreal series of encounters with functionaries who spout meaningless ideological cant, he himself becomes like them and ends up as head of the Central Inauguration and Liquidation Committee. This satire on people who sold out by advancing their interests through the Communist regime made him first nationally, and then internationally famous, and was followed in 1965 by The Memorandum. Daringly it focused on a language Havel and his brother had devised using artificial intelligence, ‘Ptydepe’, which is introduced into an organisation to promote efficiency, but alienates and humiliates everyone using it, not least those who think they are in control. Yet in the late summer of 1968, such a flamboyant liberal agenda suddenly became a remote possibility again. On August 20, Soviet tanks rolled into Czechoslovakia, ushering in harsher communist rule. Havel and his wife Olga were staying in Liberec with friends when this happened, and so were not among the crowds who protested in Prague. However, Havel’s swift response demonstrated all the characteristics that would go on to make him a leader. The President talking to people assembled on the Third Courtyard of Prague Castle, shortly before his inauguration as Czech President. 2 February 1993. Photography: Tomki Němec. Which other president would have made Frank Zappa Special Ambassador to the West on Trade, Culture and Tourism? This departure to the countryside was not so much a retreat as an enforced decision to regroup resources and wait for the next opportunity. In 1975 Havel put his neck on the line when he wrote a letter to the then Czech president, Gustav Husak, analysing the social decay wrought by communism, along with the ‘existential pressure’ of the secret police. He was not arrested then, but in 1976, when the communist regime arrested the Zappa-influenced band ‘Plastic People of the Universe’ and put them on trial for ‘disturbing the peace’, Havel – who knew the band – leapt into action. Furiously he denounced the arrest as an attack by the totalitarian system on human freedom and integrity, the essence of life itself. The following January, he helped create Charter 77, a document that criticised the government for failing to preserve the basic human rights to which it had signed up through a series of international agreements made in Helsinki in 1975. The distribution of the Charter proved almost film-worthy – when Havel and one of his chief partners in crime, the actor Pavel Landovsky, set out to distribute the document to different postboxes the secret police were waiting. According to Landovsky – who was driving a Saab as a ‘getaway’ car – the police were so desperate to catch them, that two of the police collided in their Skodas. A high-speed chase ensued, in which Havel managed to stuff a few of the copies of the charter into a post box, shortly before the Saab was surrounded, and he was dragged out of the car. In no small irony, some passers-by, recognising Landovksy as an actor, stopped to watch, thinking that they genuinely were watching a movie being made. Havel in Hrádeček, north-east Bohemia, 1996. His wife, Olga Havlová, had just passed away. Photography: Tomki Němec. On 14 January Havel was sent to jail for the first time. Over the next twelve years, he would become so accustomed to being put behind bars that he would always carry toothpaste, razor blades, and his favourite unfiltered cigarettes in case of arrest. He knew he had the chance to go into exile, but refused – though inevitably he suffered, internationally the imprisonments raised his profile, and in intellectual circles he began to be seen as the equivalent of a Solzhenitsyn. It was during this period that he wrote The Power of the Powerless, the infamous essay that asked the reader to imagine a greengrocer putting the sign ‘Workers of the World Unite’ in his shop window. To read that essay again, and appreciate the brilliance and subtlety of his analysis of how words could be used as a cloak for political oppression, is to mourn how lacking we are in such humane intelligence in politics today. Havel bows out as President at the National Theatre. Twenty-six years earlier, a communist-controlled event here – the so-called anticharterʼ – declared Havel and his colleagues from Charta 77 to be outlaws, sending them to prison. Prague, January 2003. Photography: Tomki Němec. Yet throughout the year there were tremors – protests and petitions that indicated that dissidents were gaining confidence once more. Tensions rose on 9 November when the Berlin Wall fell – then on 17 November people gathered in Prague for a peaceful protest to commemorate students arrested and killed by the Nazis. An over-aggressive response by the secret police only encouraged the demonstrations to escalate – and Havel, who had been anticipating such unrest, rushed to Prague to meet fellow dissidents. Within days the Civic Forum had been created, with Havel’s philosophical clout, international renown, and talent for co-ordination revealing him as the natural leader. On 10 December he was announced as the new president of Czechoslovakia. 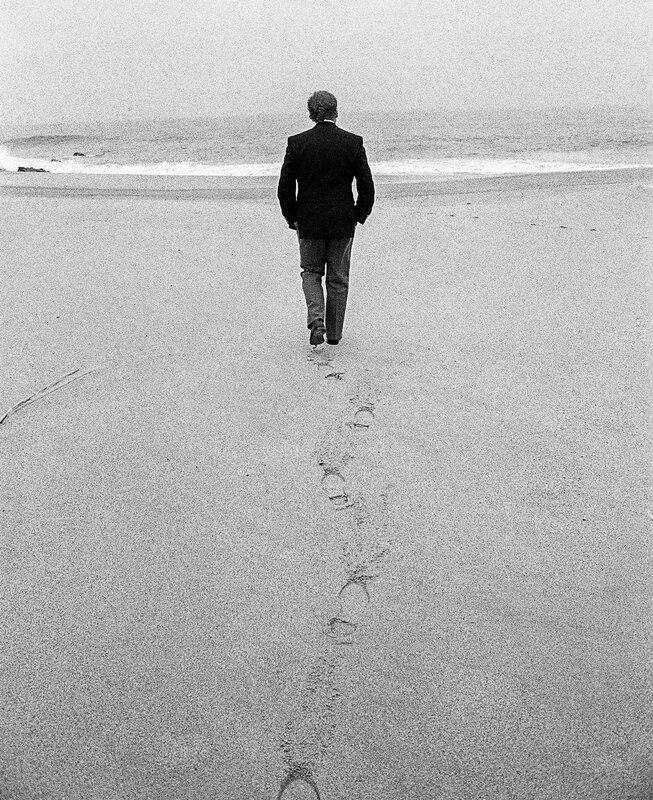 Vaclav Havel walking on the beach near Cabo da Roca, Portugal, 1990. Photography: Tomki Němec. Tomki Němec was President Václav Havel’s personal photographer – the youngest personal photographer of a head of state in the world. He has received two World Press Photo awards.